Need to encourage students to really look at the leaves and not just play with the interactive tool. Students are required to examine leaf edges using either large poster images or an online interactive tool and do some simple arithmetic to understand the differences in the leaves from different sites. This activity gives an example of how scientists themselves conduct their inquiry. Large amount of background information appropriate for educators and students is available. References to the original data, as well as that for the correlations between mean temperature and leaf morphology, are not included. An article addressing the underlying science of leaf margin analysis can be found here: Wilf, Peter. (1997). When are leaves good thermometers? A new case for Leaf Margin Analysis. Paleobiology, 23(3), 373-390 . Ideally the change seen during the early Cenozoic should be related with any effects that it had on biota. The explanation of the term "isotopes" is provided, educators need to clarify this in class. Comment from scientist: When used immediately following "Cenozoic," the term "era" should possess an uppercase "E" (i.e., Cenozoic Era). Activity uses text, images, illustrations, video and interactive forms to tell a vivid story. Activity does not include an assessment. 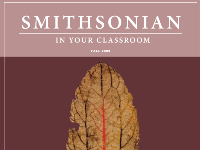 A well-documented activity with an effective online interactive tool for categorizing the leaves and using these findings to estimate the likely mean temperature when they were alive. Easy for a educator to implement in a lesson.